The Murphy Administration is suing chemical giant DuPont, and others, over its pollution of four sites across the state, days after state environmental officials ordered many of the same companies to field the costs of the multi-million dollar clean-up at several of those same sights. 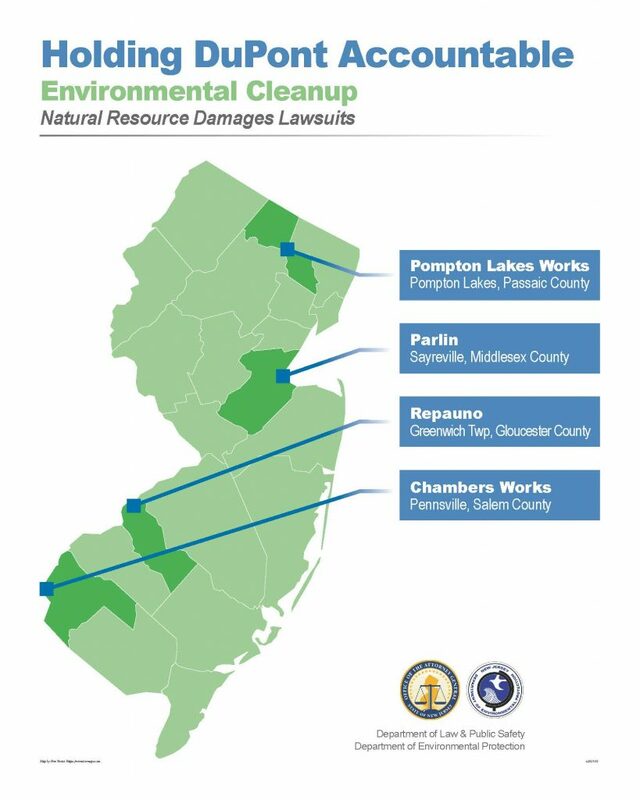 Wednesday’s suit — filed jointly by Attorney General Gurbir Grewal and Environmental Commissioner Catherine McCabe — is seeking financial damages for pollution which contaminated air, water and soil at these four sites. State officials allege DuPont knew about its fast and loose disposal of hazardous waste, called per- and polyfluoroalkyl substances, for nearly a century at the Pompton Lakes Works at Pompton Lakes, the Parlin site in Sayreville, Repauno in Greenwich Township and Chamber Works in Pennsville, which put the health of thousands of residents at risk. The suits filed Wednesday also list DuPont spinoff company Chermours and Minnesota-company 3M as defendants. “The companies we’re suing today knew full well the risks involved with these harmful chemicals, but chose to foul our soil, waterways, and other precious natural resources with them anyway,” Grewal said Wednesday in a statement. At the DuPont/Chermours Pompton Lakes Work site, which manufactured explosives and munitions, the company released trichloroethylene and perchloroethylene, as well as lead and mercury, into the surrounding soil and water supply which provides drinking water to “hundreds of homes,” according to the OAG. With the DuPont/Chermours/3M Parlin facility — a chemical manufacturing plant in Sayreville surrounded by “public parks, schools, recreational facilities, industrial and commercial businesses, and residential neighborhoods” — the site produced non-stick Teflon and paints, which generated PFAS waste that seeped into the surrounding communities, the OAG said. The DuPont/Chermours Repauno site was a 1,800-acre dynamite manufacturing plant in Greenwich Township, which released hazardous waste into the nearby wetlands, Delaware River, Repaupo Creek and residential neighborhoods, the OAG said. At the DuPont/Chermors Chamber Works facility in Pennsville, the companies released “massive amounts” of wastes containing the toxic PFOA into the landfills and the surrounding air and water, which included the Delaware River, according to the OAG. “On our watch, polluters like these who put profit above public well-being now can expect to pay for the clean-up of their contamination, for their violation of state laws designed to protect our environment and health, and, where appropriate, to fully compensate the state and its citizens for the precious natural resources they’ve damaged or destroyed,” Grewal said. Daniel Munoz covers politics and state government for NJBIZ. You can contact him at dmunoz@njbiz.com.